THE WHO: A QUICK ONE: 1966: 4 STARS OUT OF 5 STARS: The Who had failed to make it big in the US at this point. This was their second second album. 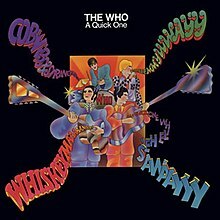 Oddly enough my two favorite songs on this album are by John Entwistle- “Boris The Spider” and “Whiskey Man.” “So Sad About Us” and “A Quick One” also favorites. Very good album- as The Who were about to make giant steps towards greatness. 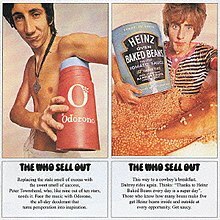 THE WHO: THE WHO SELL OUT: 1967: 5 STARS OUT OF 5 STARS: This was The Who’s first concept album- of course in the near future they would make their two most famous concept albums- “Tommy” and “Quadrophenia. Back when I got my first Who albums this and “A Quick One”- were packaged together two for the price of one and “My Generation” and “Magic Bus- The Who On Tour” were also packaged together. I”d call that a bargain, the best I ever had. The Who’s first big hit -the great “I Can See For Miles” closes off this set. THE ROCHES: THE ROCHES: 1979: 4 STARS OUT OF 5 STARS: I saw The Roches perform on Saturday Night Live and on my next trip to the record store had to buy their album. Some of these songs would play in my head for days. “Hammond Song” “We” and “The Married Men” are highlights but the entire album is a joy. I wish it hadn’t been so long since I’d listened to it. Oh man, I love The Who, though I’m not as familiar with these two albums. That being said, “I Can See For Miles” is a tune I really like. Yes “Every Picture Tells A Story” is 5 star from start to finish not a bad cut on it. Too bad Rod lost his focus- fame and the star lifestyle won out. While I completely agree I will say that because of Rod Stewart’s intriguing voice, I can even listen to some of his pop-oriented music. He’s also a pretty good live act – at least he was when I saw him at Jones Beach on Long Island about 15 years ago. I have also seen him live- back in the 90’s- it was a good show. I just think he wasted a lot of his talent on nonsense- he became a big star and kind of coasted. Just my opinion.